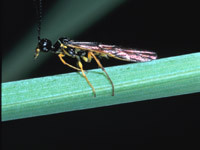 Sawflies are slender wasp-like insects with a shining black abdomen and yellow bands. They range in size from 10mm to 15mm long. Females tend to be larger than males and are easily distinguished by the presence of a serrated ovipositor at the end of their abdomen, which saws into plant stems to lay eggs, thus the name “sawfly”. Sawflies feed in the hollow stems of wheat and other cereals, usually above the 1st node below the head. They cause white heads and flagging. Often an emergence hole is in the stem above the node. Sawfly damage can lead to stem breakage or lodging prior to harvest. Montana growers have reported significant economic losses, but this pest has not been particularly problematic in Washington. Tillage has been shown to reduce wheat stem sawfly survival. Trap crops such as barley, oats, and rye near wheat fields may also attract sawflies and reduce damage to wheat. Finally, planting wheat in large blocks, as is typical in much of Washington may reduce sawfly damage because sawflies are weak flyers and will not reach the center of fields. Cultural controls are the most effective form of management. In Colorado, insecticides have not proven to be highly effective for sawfly management.